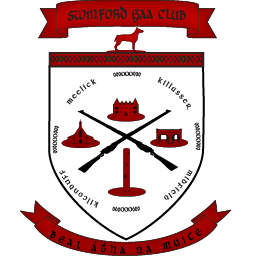 Swinford GAA Club are pleased to announce the official launch of our Souvenir Programme. This will take place on Friday 27th April at 8pm in the Gateway Hotel. The Souvenir Programme has been prepared to coincide with the official reopening and dedication of our pitch to Robert McCallion. We are delighted that former Mayo & Swinford great David Heaney, has agreed to perform the official launch for the club. The Souvenir Programme is a full colour production in excess of 100 pages. It promises to be a fascinating read for anyone with any Swinford connections. It will be on sale on the night of the launch and will go on sale in our store and in local outlets from Saturday 28th April. It is priced at €10. Here is a sneak preview of the cover.